staying at the Gaylord Palms Resort Orlando. This was a wonderful experience for my husband and myself. I love watching movies set in the Medieval era which holds such an intrigue and charm for me. Who doesn’t love watching knights with their ideals of truth, honor and glory in service of their King and beautiful Princess. This Dinner/Theater experience is almost like being in a fairytale. 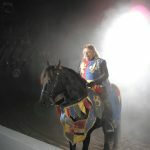 There are two shows in Orlando for Medieval Times 6:00 p.m. and 8:00 p.m. We went to the 8:00 p.m. show. We arrived to this charming Castle which set the theme of what would be offered inside. 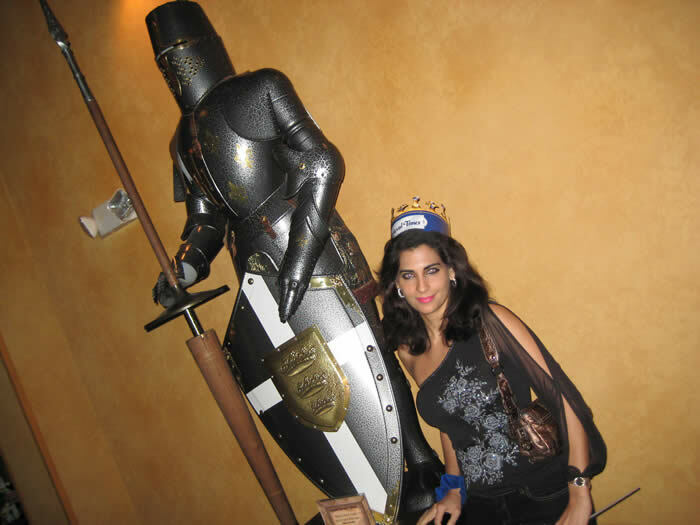 In The foyer area boasts of several expensive suits of Knights Armour which were available for sale. After purchasing our tickets which run approximately $59.00 plus tax per person and children are $38.00 plus tax per person (children under 3 eat for free). We were given paper crowns and escorted to a room where a photographer took our photo. We then climbed stairs and entered the spectacular grand room where the dinner and entertainment would take place. The tables offer bench seating that was set in a stadium arrangement on both sides of the arena. This sunken area also was a stage were the Knights and Horses roamed below the elevated box that served as a secondary stage where the royal family would reside for most of the show. As we sat down we received a complimentary full color brochure which described the activities and characters of the show. Our Napkin featured the menu that would be served that night and flags were provided for us to cheer for our Knight. 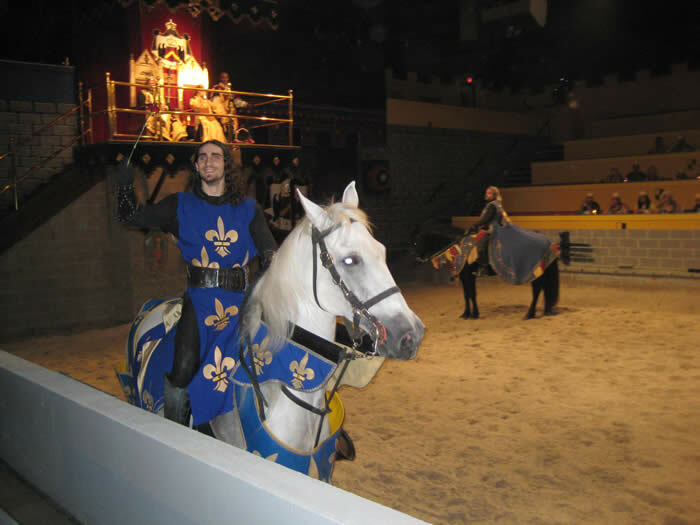 Since we were seated in the blue area we cheered for the Blue Knight. 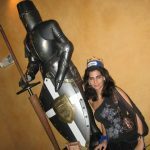 We were instructed by our waitress to cheer for any Knight except the Green Knight who we later discovered was the adversary to the Prince and the Royal Family. 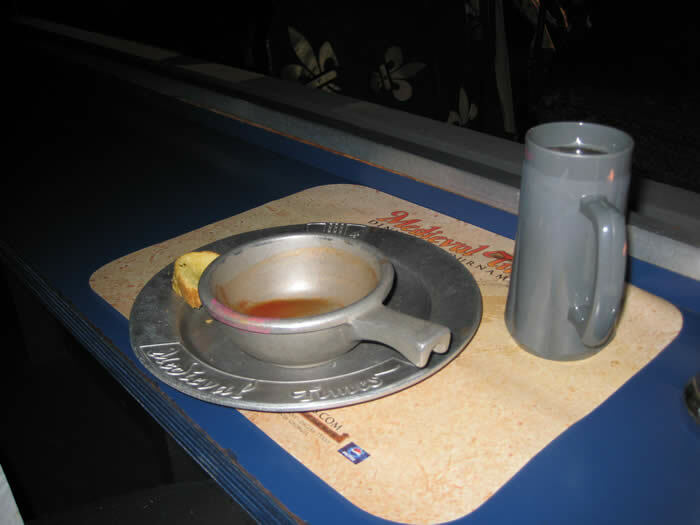 delicious meal and beverage reminiscent of Medieval times. Our meal consisted of Tomato soup and garlic bread. The main course was a half of a chicken and one sphere rib, baked seasoned potato. Although the menu seemed simplistic and courses were served individually and not altogether, everything was hot, fresh and tasty. Dessert was a delicious warmed Apple turnover pastry that left you wanting more. At the end of the night we were full and could not eat a stitch more. While the crowd participants indulged in the festivities King Philippe and Medieval Times celebrated noble guests’ birthdays. The King made special decree by mentioning individual members names and announcing the celebration of these special individuals in his Birthday Fellowship (These individuals were invited to the castle for a free feast and tournament on their birthdays). While we ate dinner the festivities and show began without ruining the story line for others, we were first introduced to the prince, then all the Knights that served the king and the Kings Court. 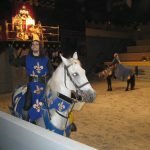 We witnessed realistic mortal combat of joisting and sword fighting that transports you back in time as if you were apart of an authentic Medieval court. Gasps could be heard in the audience as these knights of Chivalry battled, and of course in the end good triumphs over evil! memorable experience to all our family and friends. 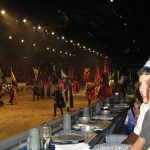 Attending Medieval Times is money well spent, and to take a loved one to this event and see the reactions on their face I would say is priceless! Gaylord Palms Resort Orlando. This was a wonderful experience for my husband and myself. I love watching movies set in the Medieval era which holds such an intrigue and charm for me. Who doesn’t love watching knights with their ideals of truth, honor and glory in service of their King and beautiful Princess. This Dinner/Theater experience is almost like being in a fairytale. 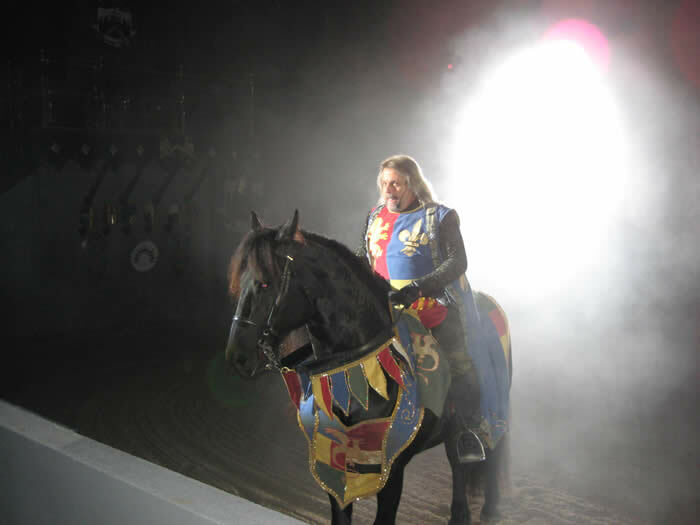 There are two shows in Orlando for Medieval times 6:00 p.m. and 8:00 p.m. We went to the 8:00 p.m. show. 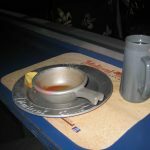 A wench dressed in a traditional Medieval costume served us our simple, yet delicious meal and beverage reminiscent of Medieval times. Our meal consisted of Tomato soup and garlic bread. The main course was a half of a chicken and one sphere rib, baked seasoned potato. Although the menu seemed simplistic and courses were served individually and not altogether, everything was hot, fresh and tasty. Dessert was a delicious warmed Apple turnover pastry that left you wanting more. At the end of the night we were full and could not eat a stitch more. While the crowd participants indulged in the festivities King Philippe and Medieval Times celebrated noble guests’ birthdays. The King made special decree by mentioning individual members names and announcing the celebration of these special individuals in his Birthday Fellowship (These individuals were invited to the castle for a free feast and tournament on their birthdays). All in all we had a great time and will recommend this wonderful and memorable experience to all our family and friends. 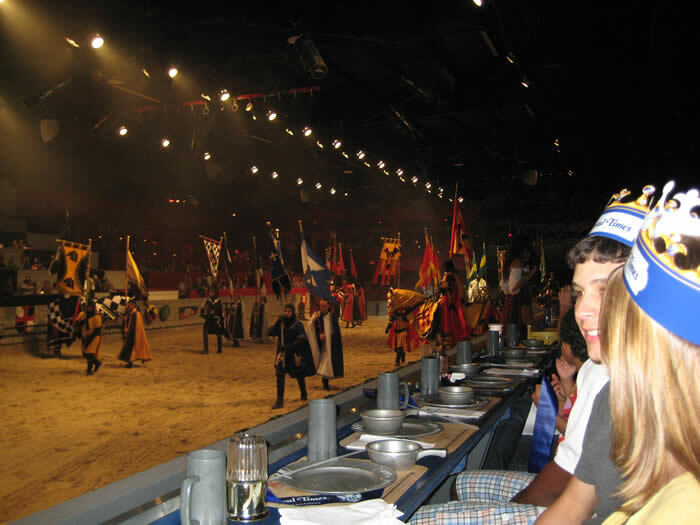 Attending Medieval Times is money well spent, and to take a loved one to this event and see the reactions on their face I would say is priceless!